Chile is a country of contrasts, stretching from the desert in the north to the glaciers of the south, and with the natural borders of the ocean to the west and the Andes mountains in the east. There are lush, temperate rainforests and volcanoes, and wine valleys abound. When planning my own first trip to South America with Knowmad I faced the same question that the travelers I work with every day do: how could I make the most of two weeks in Chile? Knowing that it’s impossible to see and do everything with about 14 days in Chile, I decided to pair two regions I love: the Atacama desert and Torres del Paine in Patagonia. With so many incredible and unique destinations it can be difficult to pare down the options, but I went with this combination because it’s one that I love doing for clients and wanted to finally do for myself. It also allowed me to add a few days in the central region to end up with a really well-rounded two-week itinerary. One of the world’s most extreme environments, the Atacama is unlike anyplace else on Earth. In fact, this otherworldly place is even used by NASA for research and as testing grounds as it so closely resembles the conditions on Mars, and it can allow you to feel closer to the universe as you take in one of clearest, most breathtaking night skies imaginable. In the far south, at the opposite end of the country, Torres del Paine offers a striking juxtaposition of landscapes. Here, granite peaks line the horizon and turquoise lakes lay out before you as you explore one of the top scenic hiking regions in the world. Combining these two regions lets you see two of the most beautiful, extreme landscapes in the world in one trip. These two destinations are incredible on their own, but seeing the differences side-by-side makes it just a bit more special. Both regions lend themselves really well to the luxury lodge model. With this model, you get a great mix of adventurous excursions during the day and then return to great accommodations, food, and wine each night. Take a look at our Best Patagonia Luxury Lodges article and our Best Atacama Luxury Lodges piece for more details on some of our favorite accommodations. Awasi, Explora, and Tierra all have properties in both locations, so combining stays at hotels within the same group can qualify for promotions such as percentages off your entire stay and/or hotel nights. Break up your time in the Atacama and Patagonia with time in central Chile, where you can visit the bohemian, historic Valparaiso with its thriving art scene, one of Chile’s famous wine valleys, or the cosmopolitan capital of Santiago. Are you interested in planning a two week trip to Chile? Call (612-315-2894) or email our to our Trip Specialists today. 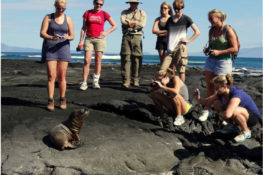 Krista’s itinerary, below, is a great trip to use as inspiration for your next adventure! Upon arrival in Santiago after your international overnight flight, you will be met by your Knowmad Adventures guide and taken on the approximately 90-minute drive to the coastal city of Valparaíso. In the morning you will be met at your accommodations to begin your half-day guided walking exploration of the coastal city of Valparaíso. After being declared a UNESCO World Heritage site in 2003, the city reinvented itself; new hotels, restaurants, art workshops, and colorful murals have restored its vitality and color. Because of Valparaíso’s unique geography, the houses and buildings are built climbing up and hanging from the hills and surrounding creeks. This labyrinthine verticality creates thousands of hideouts and you can find more than one surprise behind every corner. In your half-day guided exploration by foot, you will visit the surroundings of Echaurren Square, the foundation origins of the Port, the old banking area, and Concepción and Alegre Hills, home to most of the handicraft and artist workshops. At the end of your excursion, you can continue exploring independently or return to your accommodations. Enjoy the afternoon at your leisure amongst the colorful city streets. Today you will be transferred to the Santiago airport in accordance with your onward flight to Calama. Upon arrival you will be met by a hotel representative at the Calama airport and taken for the approximately 90-minute drive to your lodge in San Pedro de Atacama. On your arrival day, as well as each day after, your guide will meet with you to explain the many options of excursions and help you select your activity for the next day. This allows full flexibility to adjust your excursions to how you are feeling that particular day and your personal preferences. Continue enjoying your adventures throughout the region and your stay in the Atacama. After enjoying your morning at your lodge, you will be taken to the airport in accordance with your onward flight to Santiago. Upon arrival in Santiago, enjoy the evening at your leisure. This morning, you will fly from Santiago to Punta Arenas, at the southernmost tip of Chile. 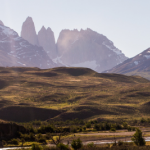 Upon arrival you will be met by an Explora representative and taken on the scenic, approximately four-hour drive through Puerto Natales and onward into Torres del Paine National Park. While at your lodge, you will be able to choose from a wide range of adventurous excursions. Enjoy panoramic views of the startling blue lakes, glaciers, and rock formations. Park highlights include the Grey Glacier, the French Valley, and the Base of the Towers, in addition to horseback riding and other hidden gems. Continue enjoying your adventures throughout the region and your inclusive lodge stay. This morning, you will be taken on the approximately 4-hour shared guest transfer to the Punta Arenas airport in accordance with your onward flight to Santiago. Upon arrival in Santiago you will be met at the airport and taken to your accommodations to enjoy the evening at your leisure. Enjoy the morning at your leisure. In the afternoon you will be met at your accommodations and your bilingual guide will lead you on an exploration of Santiago, featuring the city’s most important historic and cultural sites. You will begin at the beautiful park on Santa Lucía Hill, and nearby you will continue on to the governmental seat of Palacio La Moneda, the House of Justice, and the National Parliament. Along Plaza de Armas, the main square, you will visit the Cathedral and view the majestic architecture of the Post Office and governmental buildings. Enjoy sightseeing and people watching in this city that has been bustling with life from colonial times to present day. Following your day’s exploration, you will be transferred to the airport in accordance with your international overnight flight home. If you’re interested in learning more about a trip to the Atacama Desert and Patagonia, take a look at our Chile’s Iconic Extremes Trip Idea and/or reach out to a Trip Specialist today (at travel@knowmadadventures.com or 612-315-2894) to start planning your own custom Chile adventure!